How to order: Go to our secure online store or call 800-511-2660. We accept MasterCard and Visa. Questions? Contact us. The consumer demand for stevia has flooded the market with stevia supplements of varying quality, some with a very strong aftertaste. If what you’re looking for is high-quality stevia with NO aftertaste — Body Ecology Stevia is your answer. Body Ecology Stevia is premium white stevia in liquid form preserved with grapefruit seed extract in a dropper-style bottle that’s easy to take along so you can enjoy the benefits of stevia wherever you go. 2 ounces. $19.95. 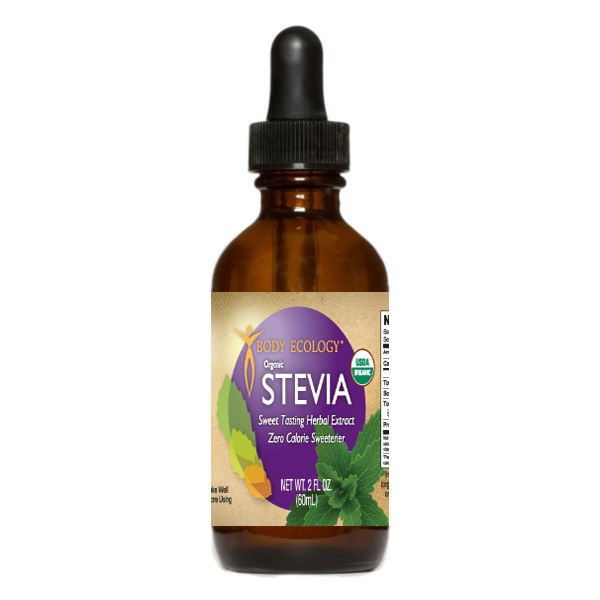 Order stevia at our online store quickly and easily. The Stevia Story – A tale of incredible sweetness & intrigue, by Linda and Bill Bonvie and Donna Gates. Just as its title says, this book tells the complete story of this sweet herb from its history of use with the Guarani Indians to its ‘rediscovery’ by much of the civilized world and the campaign against it carried on by the FDA. Also included are nine recipes and a description of the various forms of stevia now available. $6.95. To order, go to our online store. The Stevia Cookbook: Cooking with natures calorie-free sweetener, by Ray Sahelian, M.D. and Donna Gates. Okay, now that you know what stevia is, how do you take advantage of it? This is your answer; over 100 stevia recipes covering a complete variety of dishes from breakfast and dinner fare to appetizers and desserts. $13.95. To order, go to our online store.